This custom popcorn bag satisfies their cravings! Satisfy those sweet cravings with this small cone bag of caramel popcorn. Each cone-shaped bag is sealed and includes an imprintable tag and a bow. These small cone bags are filled with 0.5-oz of caramel popcorn. Perfect for tradeshows, expos, business fairs and much more! Bows are available in a variety of color options to choose from. 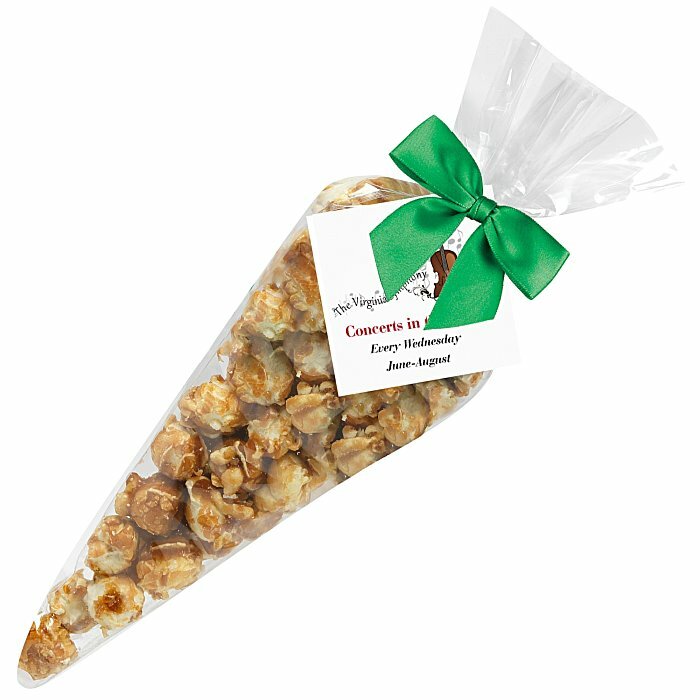 For a larger bag, please see item #137568-CA-LCaramel Popcorn Cone Bags - Large. Your price includes a full color imprint on the hangtag. USA made with US and globally sourced ingredients and materials.